Lance S. Cook is a 1996 graduate of The Culinary Institute of America in Hyde Park, New York. During his intense training at this classical French culinary college, he received numerous honors. He has since earned the distinctions of Certified Executive Chef (CEC) through the American Culinary Federation; Certified Food and Beverage Executive (CFBE) through the American Hotel and Lodging Educational Institute; is a Certified Food Safety Manager (FSM) through the National Registry of Food Safety Professionals; is a Certified Mixologist through the School of Bartending; has appeared on Television, Radio and featured in numerous Newspaper spotlights. Upon graduation, Chef Cook worked with the chefs of the Four Seasons Hotel in Boston, Massachusetts – a Mobil Four Star and AAA Five Diamond luxury hotel. The foodservice of this hotel has been honored by Zagat’s, the Boston Herald, and the Boston Globe, as well as featured in Gourmet Magazine, Food and Wine and Bon Appetit. 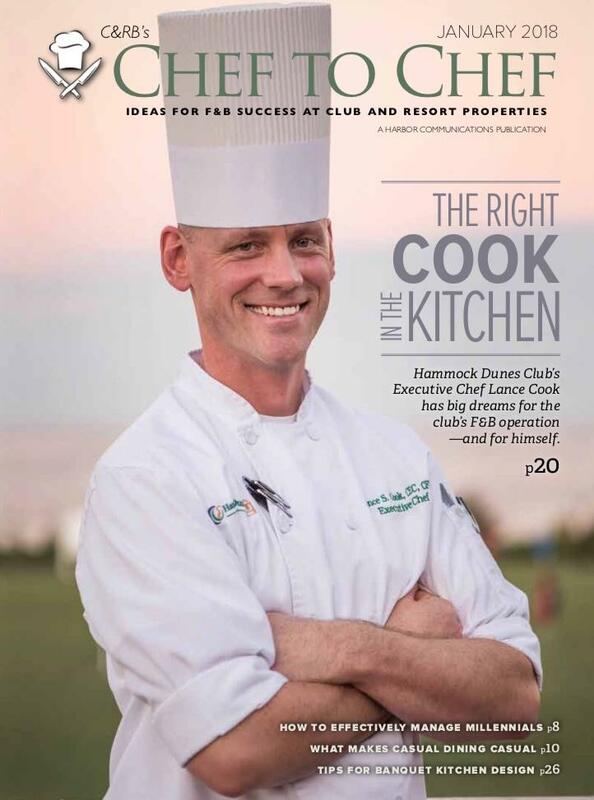 Chef Cook comes to Hammock Dunes Club after seven years at Wilson Country Club in North Carolina as the Executive Chef; seven years at Stonebridge Golf and Country Club in Albany, Georgia as the Executive Chef / Food and Beverage Director and four and one half years at Eau Gallie Yacht Club in Melbourne, Florida as the Executive Chef. Chef Cook was voted as Employee of the Year for 2015 (among 90+ employees) and received the Eau Gallie Yacht Club's Jeannette Joynes Member Service Award. 10 competing area chefs. The event raised $97,000 for the charity. In February of 2017 he was inducted into "La Chaine Des Rotisseurs" as Maitre Rotisseur. He received the distinguished "CCA" (Certified Culinary Administrator) through the American Culinary Federation in December 2017. There are under 340 CCA's in the World (as of 12/2017). highlighting his career and the club he represents - Hammock Dunes Club. 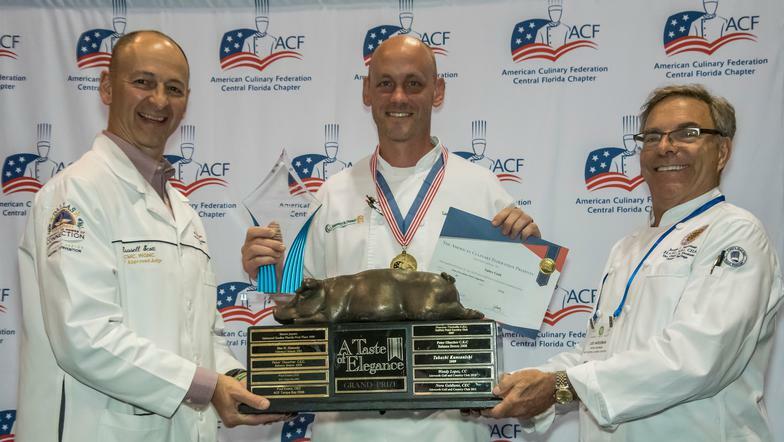 He participated in his first ACF Sanctioned KC Culinary Competition at the Florida Restaurant and Lodging Association (FRLA) Show in September 2018 at the Orange County Convention Center in Orlando, Florida. He won 2nd Place SILVER in the Duck Category with 88.16 Points and 1st Place GOLD at 90.33 in the Pork Category. Chef Cook was nominated as the Certification Chair on the Board of the St. Augustine ACF Chapter in September 2018. In November 2018, he was selected to compete for the ACF Regional Title of "Chef of the Year". He competed against 3 other chefs at the Southeast Culinary Salon on January 12th, 2019 at The Culinary Institute of Virginia Western and won Gold in the Semifinal Round with a score of 91.33. He received his World Certified Executive Chef credentials (WCEC) from WACS (World Association of Chefs Societies) in January 2019 and is progressing towards his International WCMC (World Certified Master Chef). Chef took part in a Culinary Competition held at St. John's Technical High School in January 2019. There were six area chefs that competed in a Category KC style competition -- while the students were the judges. It was sponsored by the ACF St. Augustine Chapter and St. John's Culinary Academy. The students presented Chef Cook with the highest marks and he took home the top overall prize. He took part in the Hotel Motel Restaurant Supply Show ACF Sanctioned Culinary Competition in Myrtle Beach, South Carolina on January 30th, 2019. Chef Cook came in 2nd out of 35 competitors; winning Gold with a score of 92.00 in the Wild Card Category. eSoutherngolf.com and on the MorningRead.com for his recent Gold Medals.